It might seem a little pretentious to throw an adjective like ‘Ridiculous’ in a game title. Who’s to say just how ridiculous it is? I mean, it’s fishing after all. But ridiculous is probably the perfect way to describe the premise of Ridiculous Fishing. 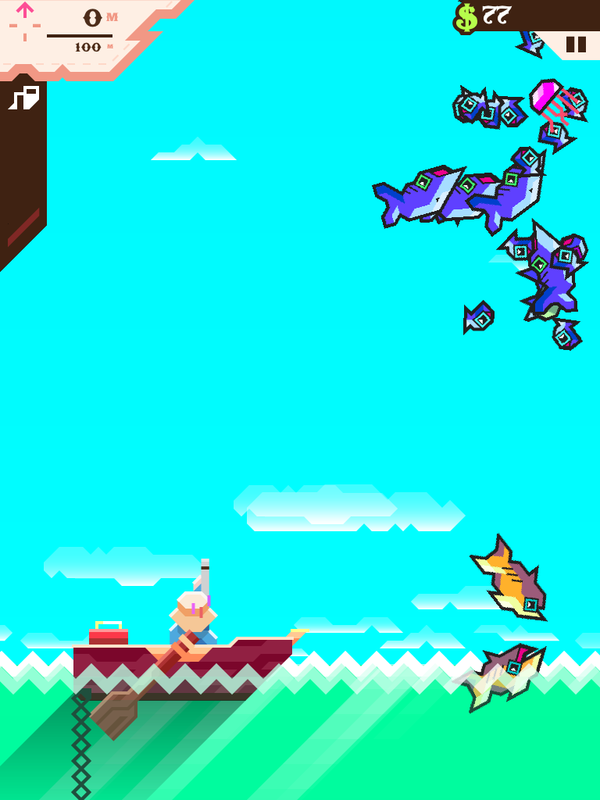 Players have to drag dozens of fish to the surface on the same hook and then blast them into oblivion with a gun. It doesn’t get much more ridiculous than that. As you learn plaything the game, though, there is a surprising amount of depth behind the absurdity. The concept behind Ridiculous Fishing is pretty simple: You drop your hook down into the waters below your boat, avoiding fish on the way down by turning your iPhone or iPad. You can travel as deep as your line will allow, but will stop earlier if you make contact with a fish. Maxing out your line or hitting a fish stops your decent and sends the hook speeding back to the boat. As your lure moves back up, you move it around, snagging as many fish as you possibly can. Once your fish have reached the boat, they’re tossed in the air for you to fire upon in mid-air by tapping. 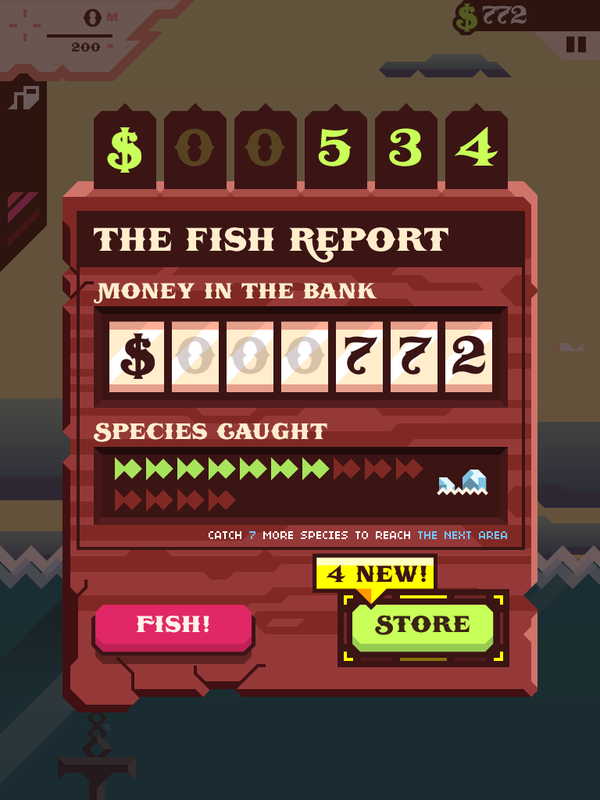 You’re rewarded money for each fish you blast which can then be used to make upgrades to your equipment. Every time you send your lure down, you’ll have a chance to encounter new species of aquatic life – which you will then murder. Every time you bring up a previously uncovered fish, you’ll move closer to gaining access to a different fishing spot. It seems simple enough, but the fluidity of Ridiculous Fishing is fantastic. The line drops, comes up, the fish fly and you shoot; All of that happens with seamlessness that makes it easy to just drop another line down and do it again. It’s a simple, arcade-style game but it plays so smooth that it’s hard not to get hooked quicker than the fish you’re trying to catch. Adding to the fluid gameplay is an unmatchable aesthetic that has been created with bold, bright colors, sharp lines with dramatic angles, and a catchy score that plays in reverse as your hook heads back up toward the surface. There’s even a story that takes place – mostly over a Twitter-style social network that will has some good laughs in it – with a surprisingly emotional ending that rounds out the undeniable charm of the game. It feels like every part of the game had time and thought put into it. Perhaps most surprising to people will be the fact that items in the game are unlocked with the money you earn out on the water blasting fish, rather than the money you earn doing your normal 9-to-5. That’s right, there’s no in-app purchases to unlock, no items intentionally made almost impossible to get simply to encourage people to take the short cut and toss a few more bucks at the developers. You pay $3 for the game and everything in it is yours to unlock by actually playing the game. Impressively, even the upgrades fit together well and compliment one another. As you purchase line that lets you travel the deeper parts of your fishing hole, you’ll notice it gets dark near the bottom. Check out the store and find a lantern that you can use to attach to your lure. If you’re having difficulties making it that far down because the fish get a little too bunched up, set the chainsaw hook on your line and cut through whatever creature gets in your way next time you cast your line. It always feels like you’re working toward another upgrade that you want, but the gameplay itself is addictive enough to keep you going back for more without a specific goal to work toward. Ridiculous Fishing is a fine title for this ridiculous game. But it’s also incredibly addictive, surprisingly charmingly, beautifully crafted, and insanely fun. We understand why all of that was left off the title, but none of it is less true. This game has come a long way since its flash game roots and has been turned into one of the best iOS games in the App Store. Download it and give it a try and tell it dosen’t catch you hook, line, and sinker.